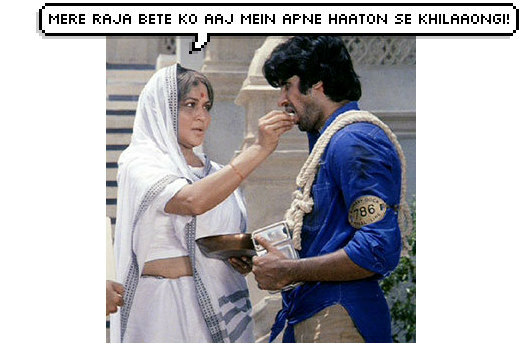 This post was winner of Blogadda Mothers Day Contest. 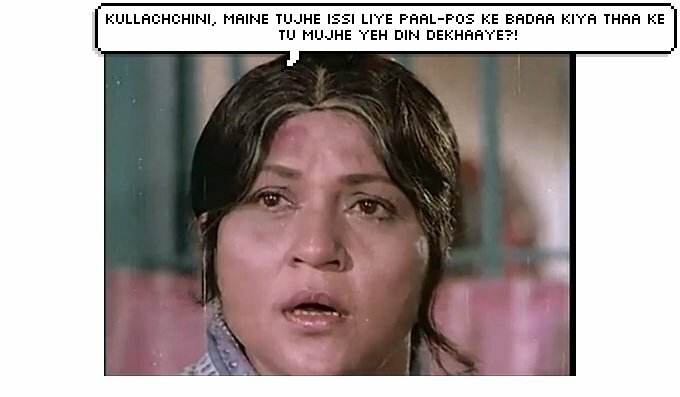 'Maa' used to be a constant fixture in Hindi movies in the 80's and 90's. A stoic and sacrificing figure, wearing a white sari and always a picture of love and devotion. A mother who was always bent over a sewing machine or working at a construction site. 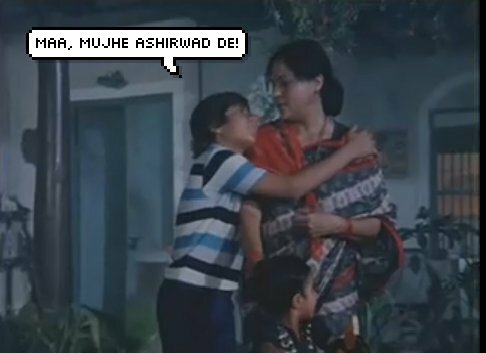 A mother who never forgot to make 'gajar ka halwa' and 'kheer' for her son. When talking of celluloid mothers how can we forget Nirupa Roy in the movie 'Deewar'. Hindi Cinema established once and for all...if you have 'Maa' then you don't need Gadi, Bangla or Paisa. Here is tribute to 'MAA' on this mothers day. 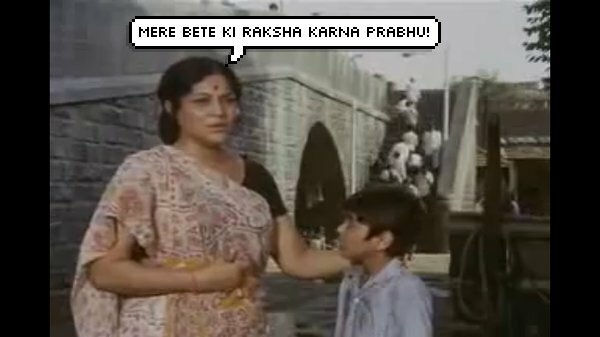 P.S: If you observe, all the 'Maa''s in Hindi movies doted on their sons...the celluloid daughters always got this..
"Mere Karan Arjun aayenge, mere Karan Arjun aayenge..."
Outrageously funny. And true the mothers in hindi cinema completely ignored the daughters. On top of that they got the worst mothers-in law. So they had nobody except god." 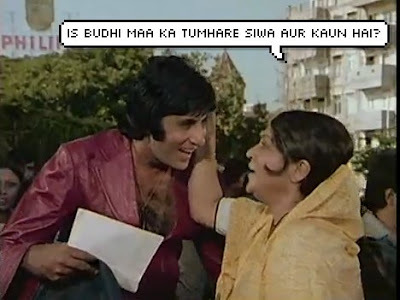 jiske paas maa nahin uske paas bhagwan hain"
:) lovely compilation and the punch line was the best! so true! 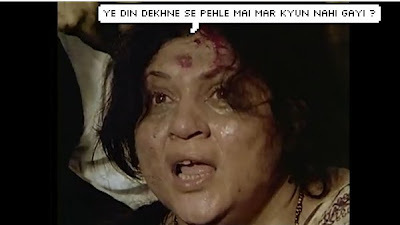 Nirupa Roy is the perfect filmy mother.You caught it ekdam right......Your real Maa and Maa in law liked this. This was good. u took me back to the olden doordarshan days too!! The knife: Ahh Lalita pawar...I did not put her cause this was a tribute to good mothers and not the evil kind. Ha ha , there was a time when she was the only mother figure in Hindi cinema. lols.. a very lovly n funny post. True ending. Haddock: yeah, she is the most famous Bollywood mother. Oh gawd those cliche corny weirdly engrossing hindi movies of the 70's.And Nirupa Roy lol. 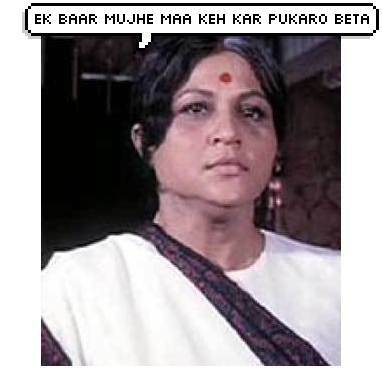 For some reason I used to find Nirupa Roy scary in my childhood days and a little khadoos too! ha ha :D loved the picture talk!!! To all the moms of the world - maa tujhe salaam! Choco: :D Welcome..and thank you so much for following me and making it a century...;;) I started following you too.. The comment boxes are looking amazing. Good job! Mr. Stupid: Yes she did...oh no...I should have put the translation in english...these are scenes from old bollywood movies. 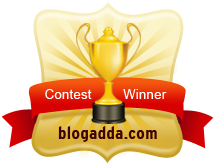 I was checking out winners on blogadda and was so overjoyed to see your blog among winners.